Being on first at a festival can sometimes be pretty tough, especially when the stage you are playing on is at the far end of the festivals site and gates only opened 40 minutes before you start. Making a bee line myself to catch the blues/rock artist Ryan Kinder (who also has a little country in him) on the Barclaycard Stage at BST Hyde Park in the blistering sun, I was met by a rather small crowd which had me worried. Ryan Kinder, as I have mentioned on numerous occasions is an artist no fan of music wants to miss should they get the opportunity to see him. Kinder not only has some of the rawest and most soulful vocals you will hear but is pretty damn impressive on the guitar too and with the festival artist company he was amongst, his music and talent fit right in. To get to the barrier was easy, it was empty, everyone was sat down bar a few people. However, as soon as Ryan Kinder came on stage and played so much as one chord, sang so much as one note, it was if all the tourist buses in London had dropped off a hoard of fans – people were arriving from every corner of the festival and what was once a handful of people was soon a crowd of cheering fans, whether they be new or old. This is the mark of a true musician, someone who can gather the masses in a single moment, someone who can turn a head, prick up ears with their talent and this is exactly what I was hoping for. 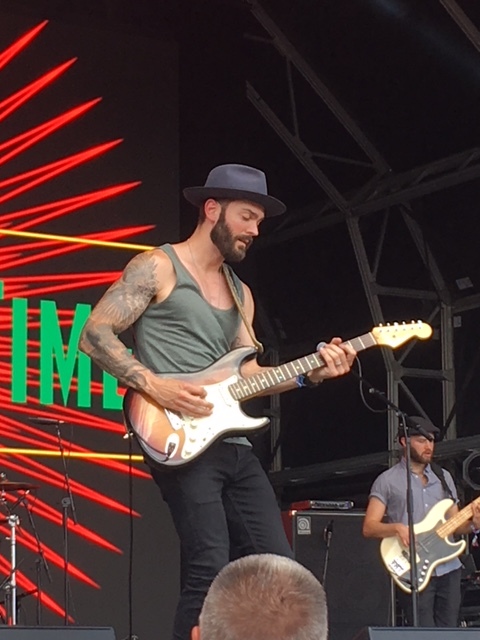 Centre stage, Ryan Kinder showed off his guitar skills proving his worth of sharing a bill with the likes of Clapton, Winwood and Santana. With playing his singles such as Close, the crowd were truly engaged throughout with Ryan and his bands electrifying sound – there were people head banging, playing air guitar, dancing and the majority just simply enjoying it. From Birmingham, Alabama, Ryan was surprised with some of his audience hailing from the same neck of the woods as he. “I mean Birmingham Alabama, not the Birmingham here” he said. “We stole everything you had and made it worse” he joked. Speaking of Alabama, Ryan played his track with the same name which has an old school sounding rock feel to it and translated very well live with its chanting, fist pumping chorus and loud, soaring sound which created an exciting atmosphere. Everything he played was the perfect setting to a heavily guitar/blues based line up. If Clapton himself had watched this set, he would be impressed and hopefully bring Ryan on stage with him one day. The “knocked it out of the park moment” or in this case the “knocked it out of the Hyde Park moment” came from closing number Leap Of Faith – a track so good it is worthy of being part of a Hyde Park headline set one day. The heavy sounds of this track filled the festival with roaring energy and I could feel the buzz surrounding his stage. If you weren’t a fan of Ryan Kinder’s before, you certainly were now. With an album yet to be released and being on the road with the likes of ZZ Top and John Fogerty, the future is more than just bright for Ryan Kinder, it is set to be so bright, not even sunglasses will block the blinding light. When John Fogerty himself tells you your cover of Fortunate Son is great, then you know you’re on to a good thing.